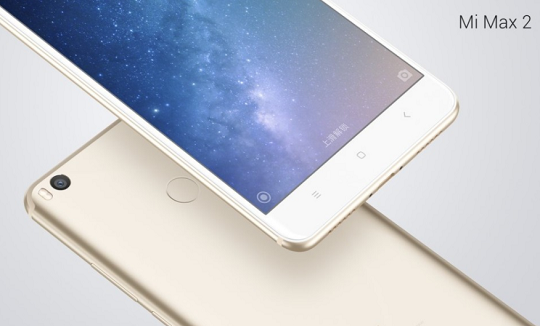 Xiaomi has officially unveiled the new Mi Max 2, which is a device that comes with a power-efficient chipset and a massive battery. The Mi Max 2 still got the same huge 6.44-inch Full HD display of the original Mi Max, but it now has more battery capacity at 5300mAh (vs. 4850mAh) with Qualcomm's Quick Charge 3.0 support. The phone also uses a new Snapdragon 625 chipset that is clocked at 2GHz. It might seem like a downgrade, but it actually compliments the Mi Max 2's battery as it is much more power-efficient. For the memory, it now has 4GB with 64GB/128GB internal storage options. In terms of the camera, Xiaomi's new phone borrows the primary sensor found on the flagship Mi 6, a 12-megapixel main shooter that has Sony's IMX386 sensor. Meanwhile, at the front, you'll find a 5-megapixel secondary camera. Other specs include a fingerprint scanner mounted on the back, two stereo speakers, and a USB Type-C port. The Xiaomi Mi Max 2 will go on sale in China on June 1 at an SRP of CNY1,699 or about Php12.3K for the 64GB variant, while the 128GB model will cost CNY1,999 or about Php14.5K. Shipping cost not yet included.